With the 2017 The Yacht Market.com Southampton Boat Show now a faint memory Scotland's Boat Show gets underway this Friday at Kip Marina. The weekend promises to be action packed with lots to see and captivate the imagination of those not interested in boats. Some highlights from the schedule for this years event include the Pelle-P fashion show, the infamous Lewmar Grinding Rig Challenge and Nick Nairn's live cookery demonstrations. No boat show however is complete without BOATS.... and around the Clyde from Troon to Greenock there will be boats galore to see both new and used. 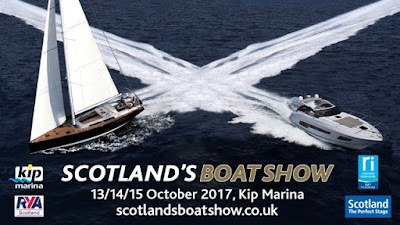 If the bustle of the boat shows doesn't appeal or you have walked the crowed pontoons and failed to find that boat that's just right for you don't forget to look at what's for sale away from the Clyde with independent brokers such as ourselves. After a frantic summer which saw unprecedented levels of sales activity for our brokerage service our resident ABYA broker and General Manager Mark Cameron has been busy working with vendors around the west coast bring some fantastic new listings onto the market. We have picked a few highlights below, find the full current list on our dedicated Brokerage Page on the website. Grand Banks motor yachts are found in all corners of the world. The unmistakable silhouette having gained a loyal following of owners and admirers who appreciate the fine craftsmanship and top quality materials used to create these excellent cruisers. 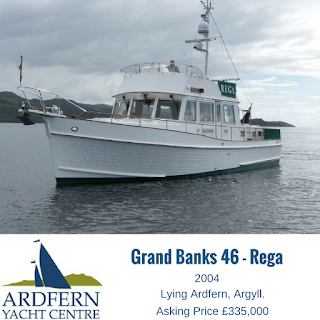 Commissioned by a serial Grand Banks owner REGA was built with no expense spared and the focus on creating a comfortable coastal cruiser capable of looking after her crew no matter the conditions. Loaded with unique features including long range fuel tanks, Trac stabilsier system, hydraulic bow thruster, electro/hydraulic tender crane; she is a magnificent example of the class and a boat not to be missed. Lying here at Ardfern, afloat and in commission. 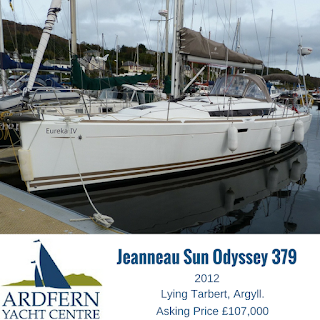 A striking modern cruising yacht the Marc Lombard designed hull with its distinct chine aft,wide stern, sleek sheerline, narrow heavily tinted portlights and plumb bow leaves the Jeanneau Sun Odyssey 379 standing out from the crowd. 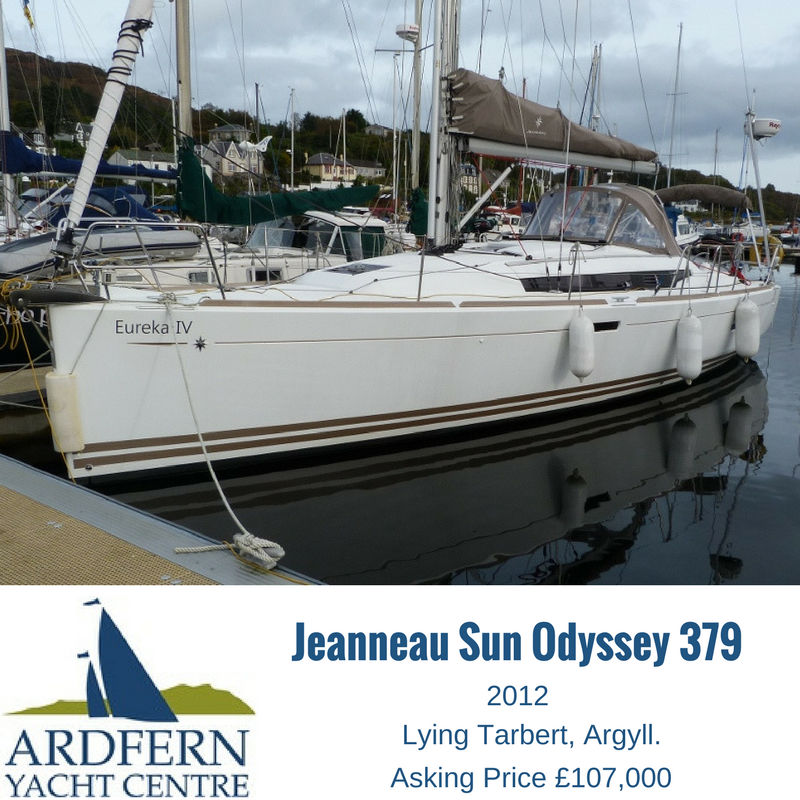 Winner of the Cruising World 2012 'Cruising Yacht of the Year' Award the Jeanneau Sun Odyessy 379 has proved to be a very capable and popular cruising yacht. Widely regarded as a better sailing boat than her big sisters the SO379 is easily sailed short handed and capable of making quick, comfortable offshore passages. EUREKA IV is a rare single owner, two cabin version of the class benefiting from a huge heads compartment and extra on deck storage. Upgraded from the standard specification to suit the owners requirements she has an extensive inventory including additional freshwater tankage, full cockpit tent and the single deep spade rudder. Lying afloat and in commission in Tarbert, Argyll we highly recommend early viewing to avoid disappointment. Presented in sail away condition AILONA is a rarely found in the UK live aboard example of the popular Nauticat 331 motorsailer. 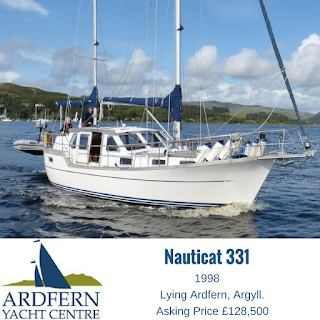 Based on the old Nauticat 33 the design of the 331 has been changed very little during the last 45 years of production. Some tweaks below the waterline have improved boat handling and sailing performance for the better while below decks the finish has been refined to an exceptional standard as you would expect from a premium Scandinavian boat builder. Accommodation is provided below decks for a total of 4 crew in comfort with a single large heads forward and the elevated wheelhouse providing panoramic views from the saloon table. Benefiting from over £20k of upgrades and re-fitting since 2015 the boat really is ready to sail, offered with a full inventory. Lying afloat and incommission on the pontoons here at Ardfern. The Bill Dixon designed centre cockpit Moody's of the mid 1990's are highly regarded by cruising yachtsmen around the globe. Offering good performance under sail with a safe comfortable deck layout and spacious practical accommodation below decks its not hard to understand why. 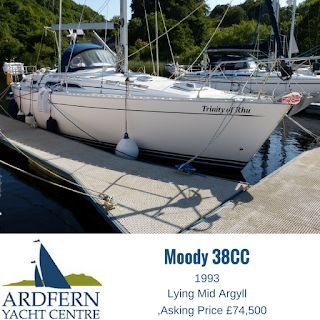 The Moody 38CC offers the cruising sailor a great platform to get afloat and explore the coasts of the UK or oceans of the World! TRINITY OF RHU is a well presented example of the class having been well looked after throughout her life and continually upgraded. Ideally suited to family cruising with 7 berths over 3 cabins, twin heads and a spacious saloon. Recent upgrades include Raymarine ST70 instruments, upgrading of the fuel system and replacement of the stern gear. Currently lying on the Crinan Canal afloat and in commission ready to sail away. Keep your eye on the website if your a Moody fan we have a very nice example of the smaller Moody 35CC coming soon. Some boats just make you smile when you row ashore in the dinghy, TILLY III definitely falls into this category. Designed and built by Morgan Giles in Teignmouth TILLY III was the result of a commission from the then Lord Devonport for a capable offshore racing yacht a role which she proved more than capable of fulfilling. Using then state of the art design and construction principles she was something of benchmark design in the 1950's and although a one-off design many of the elements found there way into subsequent designs. With only her third owners since being built TILLY III was found by the current owners following an extended lay-up and in need of some TLC. Having the skill (being a time served boat builder) the current owner embarked upon a four year hull up restoration of the boat which saw her stripped back to a bare hull and deck structure before being completely rebuilt. Since being relaunched she has completed more than 8000 miles of cruising exploring waters from La Rochelle to the Pentland Firth! With the asking price just reduced by £10,000 TILLY III is an excellent opportunity to acquire a lovely classic yacht, recently restored to the highest standards and ready to sail away. 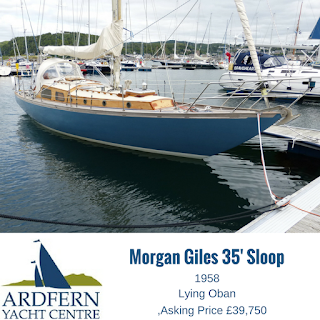 Call the office to arrange a viewing of the boat in Oban. Dehler have an established history of producing visually appealing, slippery hulled performance cruiser which are also popular with club racers. 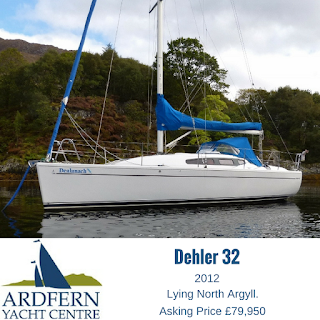 With its impressive design pedigree, coming from the board of Judel/Vorlijk & company, the Dehler 32 has gained a reputation as a rewarding boat to sail, delivering good performance at all points of sail while being well mannered enough for those looking for a quick short handed cruiser. If your looking for performance cruiser which is also a practical cruising yacht without the complications of twin rudders, carbon spars and unattractively wide sterns look no further. DEALANACH (gaelic for lightning) still with her original owners is a nicely presented one owner example of this 6 berth, two cabin design. 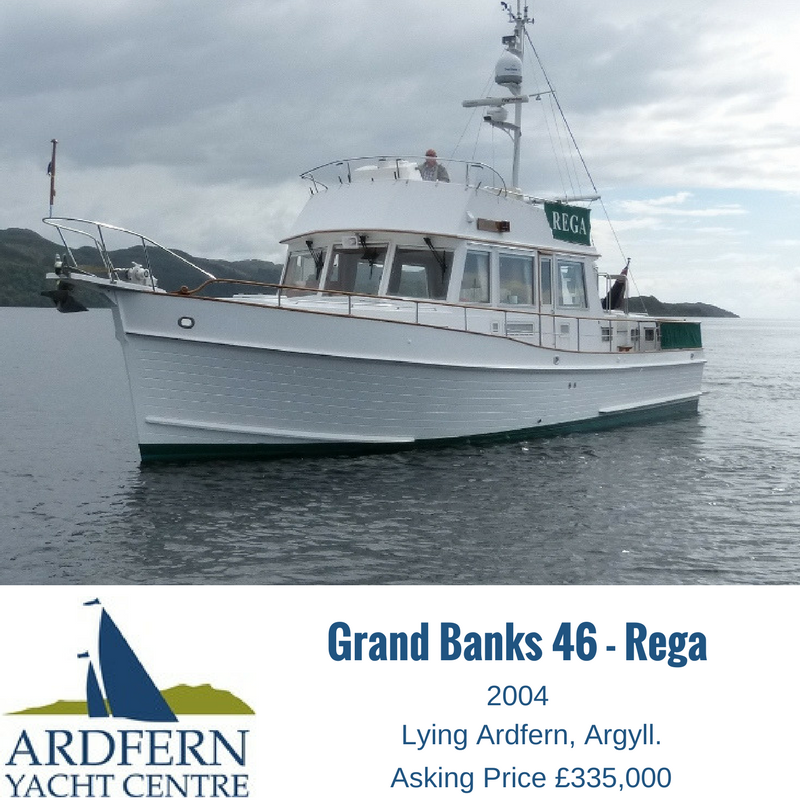 Specified from new with the 'Cruiser Pack' from the builder she benefits from Eberspacher diesel heating, 60ltr fridge, holding tank, electric anchor windlass and full Garmin instrument pack including autopilot. Cruised predominately with just two aboard she has proved to be a great fun cruiser capable of making quick passages without tiring her crew. Due to come ashore for winter storage before the end of the month the boats currently lying afloat and in commission in Lochaber. Full details of all our current brokerage listings can be found on our dedicated Brokerage Page on the website.